Herb Whittier will step down in November after more than 44 years on the job. MONMOUTH — When Herb Whittier told a friend who used to work for him on the town’s public works crew that he was retiring, he was met with disbelief. Herb Whittier is retiring after working at Monmouth Public Works for 44 years. Selectmen said they will launch a search for a public works director for the first time since Whittier took over that position in 1977. Whittier, 69, who joined the public works department in 1969, announced during Wednesday’s selectmen’s meeting that he will indeed retire on Nov. 14. “I think after 44 years it’s time to do something different,” Whittier said. Selectmen, who thanked Whittier for his service, said they will launch a search for a public works director for the first time since Whittier took over that position in 1977. “They’ll have large shoes to fill,” said Selectman Darlene Sanborn. The presentation was followed by a prolonged standing ovation by selectmen and more than a dozen other town officials and residents who attended the meeting. 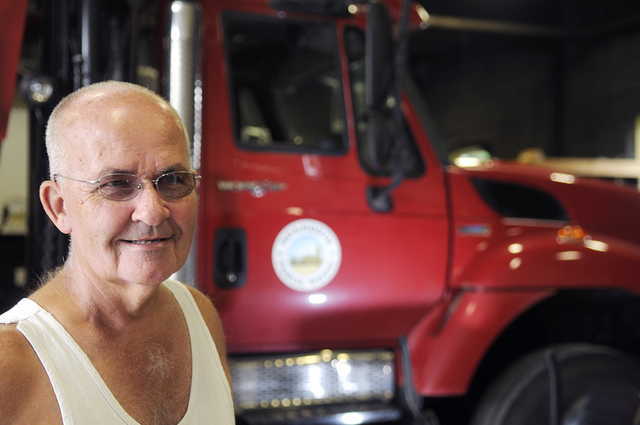 Whittier, who grew up in Monmouth, returned home in 1969 after serving in the Air Force to be an equipment operator and laborer for the public works department. He spent a year in Massachusetts in the mid-1970s but otherwise has worked with Monmouth’s Public Works department ever since. He took over as director in 1977. Pauline McDougald, who this year retired after nearly 40 years in the town office, including stints as interim town manager and as chairman of the board of selectmen, several years ago reflected on Whittier’s service.